I thought of a new avenue for writing this blog/diary. Can’t think of what it might be. The agony of parenthood? The joys of running? Collecting things? Stories that make me cringe in embarrassment? In shame? Oh oh. I can’t go there now. Oh yes, I’d like to explore my grandfather Carl Tosten Bonde’s background, his life. He has lots of people who have come after him since his birth in the 1880s. His branch bears lots of fruit. Funny how difficult that is to express. Here’s what I know: he was born to Tosten and Ingabor Bonde in Nerstrand, Minnesota. He had many, many brothers and a few sisters, but not all survived to adulthood. He was way down the list of children, so he would not inherit the family farm. He went to business college, probably in North Dakota, where he was said to have studied the Palmer method of business handwriting under the author himself. He met my grandmother, Ellen Wichstrom, who had recently graduated from Valley City Normal College in Valley City, North Dakota, and they married. They were both about 20 in 1907 when they married. They moved to Sheyenne, North Dakota, where grandpa worked as a store clerk. Later, they moved back to Nerstrand, well Faribault, where Ellen had her first child, Corinne Elsinore. Grandpa worked as a store clerk in Faribault. 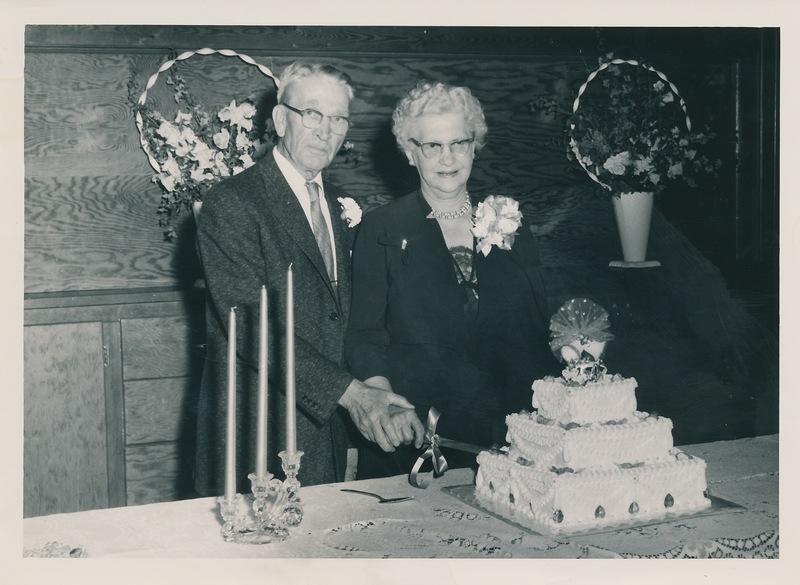 In 1957 Carl and Ellen Bonde celebrated their 50th wedding anniversary. About 40 people stayed at their house in Kalispell for the occasion. That was his aim: to break into the world of commerce from his agricultural upbringing. About 1911, Carl went into business with his brother Ben, and they moved both families to Buffalo, Montana, in Judith Gap, where they opened up the “Bonde Bros. Dry Goods Store.” The two families lived upstairs from the store and in 1912, my mother, Helen Margaret, was born at home. Family lore tells us that Mrs. Ben and Mrs. Carl did not get along well. Carl and Ellen and the 2 girls moved back to Nerstrand. 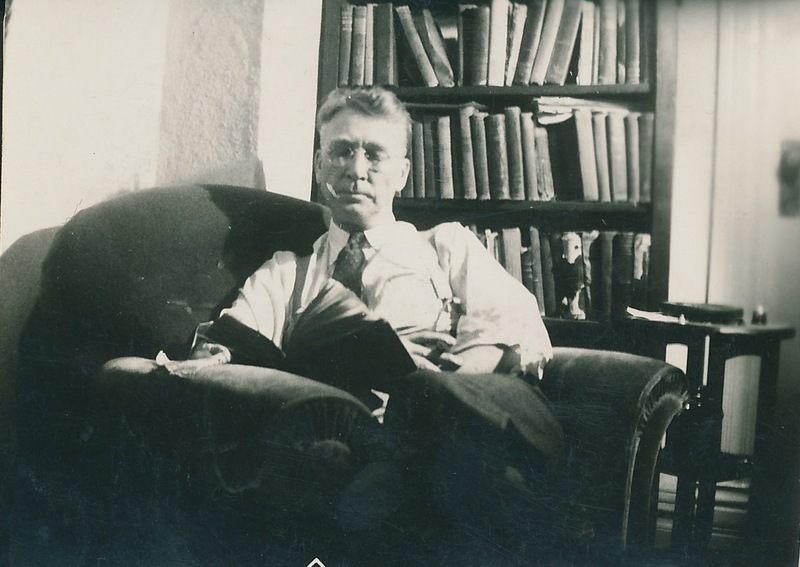 Then, while the girls and Ellen lived in Nerstrand, Carl established himself as a wholesale grocer in Kalispell, Montana, working for the Kalispell Grocery Company. Carl had gifts that suited him for the job: he spoke fluent Norwegian, his handwriting was stunningly beautiful, he was a schmooze. People liked to hang out with him. In 1915 Ellen and the girls rejoined Carl in Montana. They rented a variety of houses in Kalispell before they finally bought a place on the edge of town. In 1916 grandma bore another daughter, Carol Catherine. In 1918, Ellen’s sister-in-law died (influenza?) so Carl’s family took in Ellen’s 3-year-old nephew Sigurd Christianson. The next year Carl and Ellen’s daughter Carol Katherine died of scarlet fever in Ellen’s arms. Subsequently, in 1920, the couple had another child, a daughter, Ruth Carol, whom they called Carol. They had their only son, Carl Ralph Jr., in 1923. All of Ellen’s children were born at home. Parenting for Carl and Ellen was no easier for them than for me. Their oldest, Corinne, was cute, charming, and she eloped with a traveling salesman soon after she graduated from high school. Ellen was furious and had the marriage annulled and somehow got Corinne to return home. Helen, by contrast, was a “good girl” who went to Valley City Teacher’s College like her mom did. Helen got a job in a rural town somewhat near Kalispell at Niarada, Montana. She ended up meeting Robert P. Struckman in Missoula when she was taking summer education courses in the early 1930s. She married him in 1931, a union that Ellen just barely approved because she didn’t like Robert’s liberal politics, among other reasons. In 1941 after Carl, Ellen, Ruth Carol, and Carl Jr. moved to the edge of town on Ashley Creek, Ruth Carol married Philip Hugh Judd. Corinne became librarian assistant in Kalispell, then head librarian in Lewistown, Montana, where she met Norman B. Ackley, who was then in the US Army Air Corps. They were soon married. In 1941 Carl Ralph Bonde, Jr., graduated from high school in Kalispell, then attended college in Missoula. Summers he worked as a fire lookout in Glacier Park on Huckleberry Mountain. In 1943 Carl was drafted into the army. After a year of training, which included a stint in the A.S.T.P. as an army college student in Grand Forks, North Dakota, Carl was sent as an infantry machine gun ammo bearer to England with Company E, 262nd Infantry Regiment, 66th Infantry Division. The division was stationed near Dorchester at Camp Piddlehinton. December 15 Hitler attacked Belgium as a surprise to everyone who thought World War II was practically over. Exactly one week later Carl and his division boarded several troopships for France. One of the ships, the SS Leopoldville, was sunk by a torpedo from U-486. The other ship landed at Cherbourg France. Carl and Ellen received a telegram soon after that stating that their son was missing in action. Thirty days later they received a second telegram stating he had been killed in action. Their son’s body was never recovered. Carl and Ellen lived in Kalispell on the edge of town where they gardened and entertained numerous grandchildren. Ellen liked to attend “Ladies’ Aid” and “Circle.” Carl continued to hunt and fish and schmooze with his old Norwegian cronies. He had a large vegetable garden. Ellen had a large rock garden. She dug around in her garden with an old worn-looking hunting knife. Many of the rocks were petrified wood. She and Carl used to make road trips before he got sick with emphysema. They had a big 50th wedding anniversary gathering at their house in 1957. Carl died of respiratory failure at 72 in 1959. After that, we helped grandma dispose of most of her possessions and she moved in with me and Helen in Missoula. Grandma moved across Missoula, then to Dillon, Montana. She died there in 1967, age 80.